Buffalo’s Dontay Caruthers scored 12 points, including eight in the first half in an 88-79 win Friday at Kent State. (Robert Kirkham/News file photo). 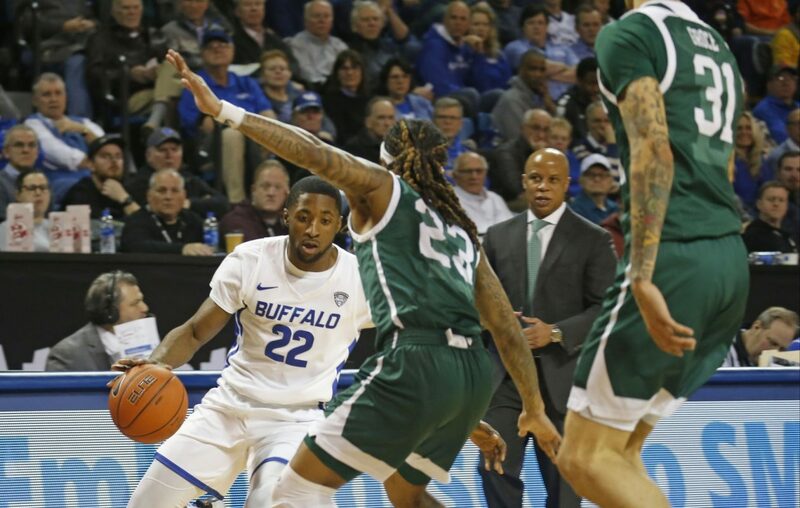 KENT, Ohio – University at Buffalo men’s basketball coach Nate Oats is very familiar with Kent State guard Jaylin Walker. Oats coached Walker at Romulus (Mich.) High School a few years ago, and knowing his prowess as a shooter, Oats assigned his best defensive players to guard him on Friday at the M.A.C. Center. At times, the challenge of defending Walker felled CJ Massinburg. It wore out Dontay Caruthers, too, who is arguably UB’s top defensive specialist. But when Caruthers left the court with 5:22 left, Massinburg took over, offensively and defensively, in the Bulls’ 88-79 win against the Golden Flashes. “The good thing is, we’ve got two other guys who are almost as good,” Oats said. “CJ takes pride in his defense and he’s our leading scorer a lot of nights, but he really studied Jaylin. He wanted the matchup. He asked for him again, late. CJ struggled early on him and Dontay came in, wore him out and did an unbelievable job on him. CJ finished it and Davonta Jordan did a pretty good job on him, too. Massinburg and Nick Perkins each scored 20 points for the Bulls, and Caruthers scored eight of his 12 points in the first half and hit a pair of 3-pointers – he entered the game 4-for-18 on 3-pointers – that helped the Bulls rally from a 13-point deficit less than eight minutes into the game. “Dontay is a guy who, you know, he doesn’t get much credit for his shooting ability but he probably shoots the ball better than anybody in practice,” Perkins said. “When he gets in games, he kind of gets a little passive but tonight, he got some good looks and was able to shoot the ball well. Walker led all scorers with 21 points, but scored only six in the second half. He didn’t expect the Bulls (18-2, 6-1 MAC) to assign three different players to guard him. At one point, though, Perkins was UB's only answer to the Golden Flashes (15-5, 4-3), as he scored seven points in two minutes for the Bulls, who trailed 25-12 less than seven and half minutes into the first half. But Perkins and Caruthers ultimately ignited the Bulls. Perkins hit five of UB's nine field goals in a stretch that helped the Bulls cut Kent State's lead from 31-17 with 9:43 left in the half to 33-30 with 6:52 left in the first half. Then, the Bulls tied the game at 35-35 on Caruthers’ first 3-pointer with 5:24 left. Caruthers' free throws cut it to 33-30 with less than seven minutes left in the first half, part of a run by the Bulls that tied the game at 35-35 on Caruthers’ first 3-pointer. UB appeared to take a 45-44 lead at the end of the first half on Davonta Jordan’s buzzer beater. But officials waved the layup off, as the ball was in Jordan's hands before the buzzer went off, and the foul happened in the act of shooting, before the buzzer went off. The Bulls took that 45-44 lead less than a minute into the second half on Jordan’s layup off a steal, and the Bulls and the Golden Flashes traded the lead only twice in the first 10 minutes of the second half, and were tied twice, at 71-71 with 6:01 left and at 73-73 with 5:22 left. After Caruthers went to the bench, Massinburg (20 points) keyed a sequence with less than five minutes left in the game in which the Bulls broke a 73-73 tie and went on an 11-2 run that included four points on back-to-back dunks off steals by Jeremy Harris and Massinburg with 2:38 left.